Many brands take to social media to try to convert followers into sales, but few can actually walk away with a success. For the ones who do walk away with a successful kickoff on social, the results are mind blowing. Daniel Wellington is one that’s done this impressively and continues to still to this day. The vintage watch design with it’s iconic NATO strap was inspired by the British Gentleman’s design. When founder Filip Tysander needed to get his unisex watch into hands of consumers, there was only one shot at making it big and that was with influencer marketing. Working with macro influencers (aka celebrities) to everyday Joes and Janes, the brand has expanded from local awareness to global recognition. Daniel Wellington is one of the first brands to fully understand the potential of influencer marketing and execute on it on a global scale. Not many brands can say it, but social influencers are largely responsible for the rapid growth of Daniel Wellington watches. Social media strategists targeted thousands of Instagram macro and micro-influencers ranging from a variety of specific groups such as travel, fashion, photography, and lifestyle and managed them as they pushed out hundreds and thousands of quality content pieces. Want to know how they did it? Daniel Wellington’s influencer marketing strategy included distributing watches to micro-influencers and providing them with a unique 15% discount code for their followers. Influencers are asked to post on Instagram using the #danielwellington hashtag and to include the discount code. All influencers are provided with full creative control and have the ability to post what they please. Although user-generated content varied in forms of creativity and style, one thing remained consistent throughout the posts - the inclusion of a personalized discount code in all captions. These codes not only measure the effectiveness of each influencer but is also used as a benchmarking tool in order to strive for continual improvement. The cost of this campaign? The production cost of watches. This marketing technique allowed for Daniel Wellington product to be seen by a variety of users, with various interests and locations. It was a very accessible form of advertising and created a huge buzz around the brand (and world), and users were exposed to DW watches reach on Instagram in return. Daniel Wellington doesn’t just focus on utilizing the largest influencers but instead employs plenty of influencers to ensure maximum reach and exposure across the globe. Daniel Wellington has focused on brand fit over popularity when choosing influencers. This has been key to their success, as influencer marketing campaigns tend to fail when brands pick vanity metrics over genuine partnership opportunities. DW’s partnerships have been carefully selected based on the individual's style and personality, and each account aligns with their brand and story seamlessly. As 95% of all social content being user-generated, DW’s success is reliant on its community. The company’s social media team focuses on brand relationships with influencers just as much as interacting with other customers. 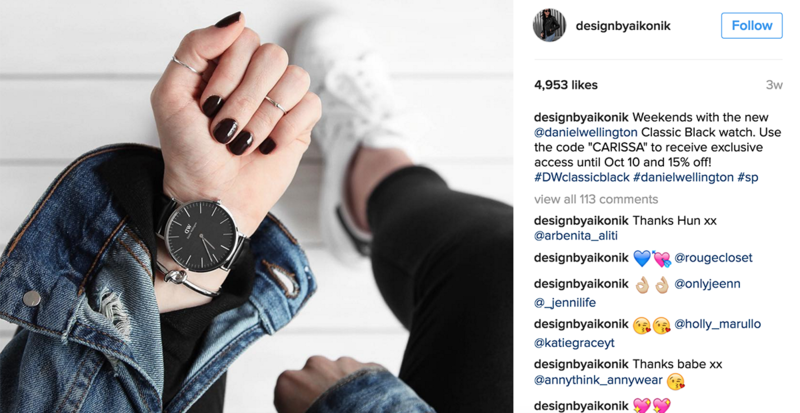 Daniel Wellington’s Instagram pictures vary widely in styles because micro-influencers have complete creative control. Their #DWPickoftheDay campaign has been a strong marketing strategy to receive a variety of pictures, and the winner of the daily contest gets to be featured on the Instagram page and receive a free watch. Through the use of specific discount codes for influencers, Daniel Wellington is able to gain access to measure which partnerships perform better over others. Daniel Wellington has grown from a $15,000 a year startup into a $230-million-dollar business with 4 million followers through the power of influencer marketing. Due to this amazing success, in 2017, Daniel Wellington received an award for the best overall performance in influencer marketing. The company has clearly taken influencer marketing to the next level and has inspired others to do the same. Be inspired by this success story and start creating your influencer marketing strategy today with tools such as Socialpeeks - a hands off approach to running a successful campaign backed by technology. Learn more at www.socialpeeks.com.